One of the problems in the green building world is the lack of clarity in the terms used. I have been complaining about the term Net Zero Energy for years, claiming that it had little to do with green building at all, that “you can make a canvas tent net-zero if you have the money to put enough solar panels on it.” There was no real satisfactory definition, no rigorous certification. Net Zero Energy is quickly becoming a sought after goal for many buildings around the globe – each relies on exceptional energy conservation and then on-site renewables to meet all of its heating, cooling and electricity needs. Yet the true performance of many developments is overstated – and actual Net Zero Energy buildings are still rare. • Limits to Growth (in part): Curbs the building’s contribution to the effects of sprawled development, which undermines the positive impact of achieving net zero energy building operation. 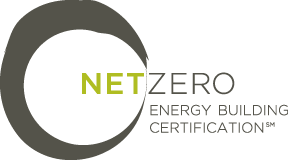 • Net Zero Energy: Serves as the primary focus of Net Zero Energy Building Certification. • Rights to Nature: Ensures that the building does not preclude another building from achieving net zero energy operation as a result of excessive shading. • Beauty + Spirit and Inspiration + Education: Underscore the notion that renewable energy systems can be incorporated into a building in ways that are attractive and inspiring. Early on, the design team chose to conform the building to the street grid – which is oriented 40 degrees off true north — in order to be good neighbors and affirm that sustainable buildings don’t have to stand apart from their neighbors. The energy penalty associated with being off the solar axes was accepted in favor of a massing that contributed to the urban fabric of the community. The Living Building Challenge is the toughest label in green building. The Net Zero Building Certification is much more approachable, almost an LBC Lite. That’s one of the wonderful things about it; notwithstanding its name, it actually is about more than just energy, that you have to do it right. Furthermore, you have to prove it. Like the Passivhaus/ Passive House, the Net Zero Energy Building Certification has, in my opinion, a lousy name that doesn’t truly reflect how differently the term is used. I am not sure co-opting a name in common use was the best approach. Nonetheless it is a great step forward in defining and refining the concept of a building that gives back more than it takes. I suspect that it is going to attract a wide following. Sources of pollution include car exhausts, power stations, emissions from agriculture and industry – as well as heating in people’s homes. Dr Kurt Straif, from IARC, said: “The air we breathe has become polluted with a mixture of cancer-causing substances. Dr Julie Sharp, the head of health information at the charity, said: “It’s important that people keep the risk from air pollution in perspective. Dr Rachel Thompson, head of research interpretation at the World Cancer Research Fund International, said: “This latest evidence confirms the need for government, industry and multinational bodies to urgently address environmental causes of cancer. And for all those traffic and parking problems, nearby residents can expect little benefit from the project. Those bucolic scenes of people walking through the forested grounds or eating lunch in the grass near the spaceship? Those will all be employees — assuming they’re able to break away from their desks. Apple says the campus will be closed to the public, and a fence around the perimeter of the property will guarantee that. The public won’t even get to use a long-planned creek trail that would have run through the southeastern corner of the property, because Cupertino acquiesced to Apple’s paranoid security concerns. Area restaurants and shops shouldn’t get too excited about having Apple move into the neighborhood, because employees are likely to stick to campus most of the time. Because the main building is set back from the street and the project is in a largely residential area, there are few retail businesses within easy walking distance. Also, Apple is doing what it can to encourage employees to stay on site, including a corporate fitness center and a large cafe inside the campus. Apple says that this building “is all about green and all about innovation.” Thatis open to debate; I still call it the world’s most beautiful prison. EnAlgae project coordinator Dr Shaun Richardson said micro-algae – the green water on ponds – would be the most suitable to turn into fuel. Illegal logging is a big problem in certain countries, and even in countries where it’s relatively under control, it’s possible for people to buy illegally harvested wood unwittingly because it often gets ‘laundered’ with fake paperwork from a legit-looking source. This is what a 3-year investigation by the Environmental Investigation Agency (EIA) has uncovered in Russia. The forests of the world must be protected. We know how to sustainably harvest wood, there’s no excuse. Amidst the debates over GMO labeling laws, it’s a good moment to take a look a the first genetically engineered food. What’s fascinating is that genetic engineering was a kind of selling point for this fruit. In some ways, GMOs are suffering from a massive branding crisis. The efforts of big agrochemical companies like Monsanto to obscure the origins of genetically engineered plants creates a kind of void where we imagine the worst. But for the Flavr Savr, transparency was an advantage and discussions about how the genes of the plant were manipulated also communicated its benefit to the consumer. Maybe the public won’t be convinced that vegetables that produce their own insecticides are healthy. But the argument has been made that biotech companies could benefit from more transparency. If you’re not familiar with Retro Report, it’s a nonprofit online video project that takes a long-term look at some of the biggest news headlines. You can watch more Retro Report stories on The New York Times website.